We would like to Thank You for taking time to visit our website. 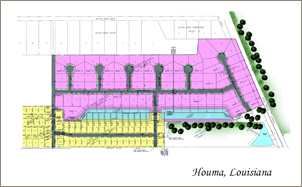 We hope you find the information provided helpful as you search for your new home or home-site in the Houma / Thibodaux area. Feel free to contact us or any of the local quality homebuilders listed throughout this site. We think that it is important when you are making a large investment such as a home purchase, that you have many options as you make your decision. We feel that you should have the opportunity to pick a Builder that you feel comfortable with. Please review the list of Local Quality Homebuilders that are approved to build in each of our Communities. Interview them, ask for references. Many Developments in today's market only offer one Builder. You should have a choice. © Copyright 2018 RJ Developments, L.L.C.